Some of G. K. Chesterton’s fervent defenders (especially those who would like to see him declared a saint) argue that he could never have been antisemitic because he was a staunch and early critic of Hitler. The argument that he could not have been antisemitic on the grounds that he criticised Hitler is weak and unsound. Interpreted in the very best light, it would only demonstrate that Chesterton, in the final years of his life, eventually overcame his anti-Jewish discourse. However, the evidence does not even support the conclusion that he overcome his antisemitic prejudice, for there is little to suggest that he actually altered or softened his opinions about Jews or the so-called “Jewish Problem” after Hitler rose to power in Germany. If anything, Chesterton considered his critiques of “Hitlerism” and Nazi antisemitism to be entirely consistent with his earlier deprecating stereotypes of the Jew and his proposed solutions to the Jewish Problem. As far as Chesterton was concerned, the rise of Hitlerism clarified the urgency of solving the so-called Jewish Problem. Significantly, he not only continued to maintain his antisemitic stereotypes of the Jew from 1933 onwards, he incorporated them into the very articles in which he condemned and criticised Hitlerism. So yes, he did say in an oft-quoted interview in 1933 that he was “quite ready to believe” that he and Belloc would “die defending the last Jew in Europe” (“Mr. G. K. Chesterton on Truculent Prussianism,” Jewish Chronicle, 22 September 1933, 14.) But then he also claimed in G.K.’s Weekly in July 1933 that “it is perfectly true that the Jews have been very powerful in Germany. It is only just to Hitler to say that they have been too powerful in Germany.” Chesterton argued that it will be very difficult for Hitler to persuade Germans to amputate the Jewish contributions to German culture, such as Heinrich Heine and Felix Mendelssohn. “But again,” he continued, “it is but just to Hitlerism to say that the Jews did infect Germany with a good many things less harmless than the lyrics of Heine or the melodies of Mendelssohn.” Chesterton went on to state that “it is true that many Jews toiled at that obscure conspiracy against Christendom, which some of them can never abandon; and sometimes it was marked not be obscurity but obscenity. It is true that they were financiers, or in other words usurers; it is true that they fattened on the worst forms of Capitalism; and it is inevitable that, on losing these advantages of Capitalism, they naturally took refuge in its other form, which is Communism” (G. K. Chesterton, “The Judaism of Hitler,” G.K.’s Weekly, 20 July 1933, 311). 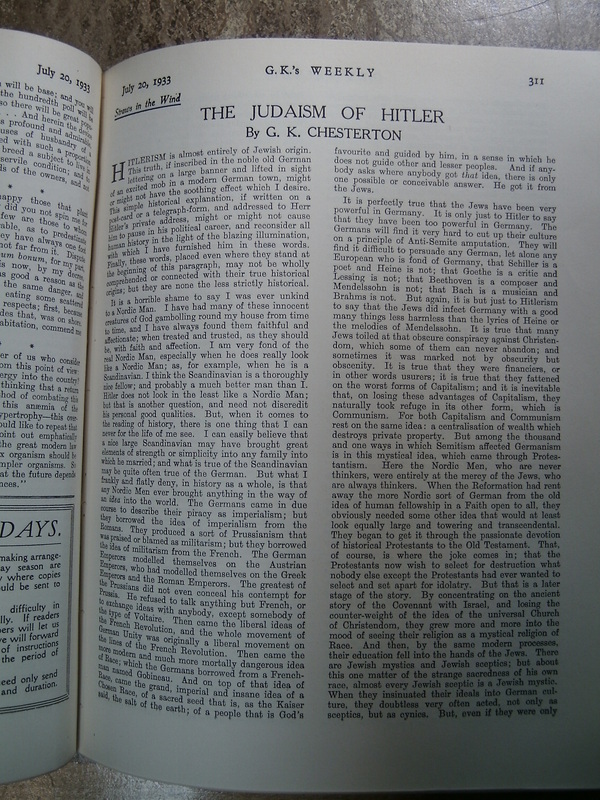 G. K. Chesterton, “The Judaism of Hitler,” G.K.’s Weekly, 20 July 1933. Chesterton repeated the antisemitic stereotype of rich greedy Jews in other articles that were critical of Hitler. For example, in an essay entitled “On War Books,” he condemned “Herr Hitler and his group” for “beat[ing] and bully[ing] poor Jews in concentration camps,” but then he stated that “what is even worse, they do not beat or bully rich Jews who are at the head of big banking houses” (G. K. Chesterton, “On War Books,” G.K.’s Weekly, 10 October 1935, 28). Interestingly, a later version of this essay, published posthumously in a volume entitled The End of the Armistice in 1940, omits the entire sentence in which Chesterton lamented that rich banking Jews escaped the beating and bullying (G. K. Chesterton, “On War Books,” in The End of the Armistice, edited by Frank Sheed, London: Sheed & Ward, 1940, 192). Presumably the decision to remove the offensive sentence was made by Frank Sheed, the volume’s editor and publisher. Chesterton repeated the stereotype of the pro-German Jew in his critique of Hitler. He asked, “was Hitler really so ignorant, that he did not know that the Jews were the prop of the Pro-German cause throughout the world?” (G. K. Chesterton, “A Very Present Help,” G.K.’s Weekly, 4 May 1933, 135). Chesterton criticised Hitler, and then repeated his claim that there is a Jewish Problem. He stated that “there is a Jewish problem; there is certainly a Jewish culture; and I am inclined to think that it really was too prevalent in Germany. For here we have the Hitlerites themselves, in plain words, saying they are a Chosen Race. Where could they have got that notion? Where could they even have got that phrase, except from the Jews?” (G. K. Chesterton, “A Queer Choice,” G.K.’s Weekly, 29 November 1934, 207). Chesterton’s criticisms of Dreyfus and the Dreyfusards, which he often repeated throughout his journalistic career (link for G. K. Chesterton and the Dreyfus affair), were also repeated in his critiques of Hitler. He stated in March 1933 that when England “wanted to abuse France, where there is really very little real Anti-Semitism, we turned the world upside about the condemnation of one isolated individual Jewish officer, who had attained a high position of confidence, and who was charged, rightly or wrongly, with violating that confidence.” Chesterton combined criticising the Germans for persecuting Jews with repeating his earlier assertions that Dreyfus was probably a Germany spy. According to Chesterton, the English were never informed that “Dreyfus had got leave to go to Italy and used it to go to Germany; or that he was seen in German uniform at the German manoeuvres.” Chesterton criticised Hitler for persecuting ordinary Jews, and then observed that in the case of Dreyfus, the “particular Jew in France may or may not have been a traitor; but at least he was tried for being a traitor” (G. K. Chesterton, “The Horse and the Hedge,” G.K.’s Weekly, 30 March 1933, 55). As Julia Stapleton has rightly noted, it seems that it never occurred to Chesterton to question whether there was any truth in the highly dubious allegations that Dreyfus was seen “in German uniform at the German manoeuvres,” or whether the claims “were suspect and thus beyond the realms of responsible journalism” (Julia Stapleton, Christianity, Patriotism, and Nationhood: The England of G. K. Chesterton, Plymouth: Lexington Books, 2009). Chesterton also sometimes defended Hitler as if he were a mere puppet or “tool”. In September 1934, he stated that “I may possibly cause some surprise, if I conclude the composite portrait by saying that in certain aspects, and under certain limitations, I do not believe that Hitler is altogether a bad fellow; and that he is almost certainly a much better fellow than the men who are going to use him.” Chesterton suggested that in the beginning “he did really intend to do something for the poor, and especially for the peasants.” If he “did not do enough for his better ideas, and later did much more for his worst ones,” Chesterton argued, then “the reason is quite simply that he is not the Dictator.” He concluded that Hitler’s puppeteer or “drill-sergeant” will “soon give him his marching orders again” (G. K. Chesterton, “The Tool,” G.K.’s Weekly, 6 September 1934, 8-9). He repeated this idea in March 1936, when Hitler ordered the occupation of the Rhineland in contravention of the Versailles treaty. Chesterton stated that: “I have always said that there were healthy elements in Hitlerism, and even in Hitler; indeed I rather suspect that Hitler is one of the healthy elements in Hitlerism.” Chesterton argued that Hitler was “a better man than the men around him or behind him” (G. K. Chesterton, “Why did he do it?”, G.K.’s Weekly, 26 March 1936, 18). As mentioned near the beginning of this short essay, Chesterton did say in an interview in 1933, that he was “quite ready to believe” that he and his close friend Hilaire Belloc would “die defending the last Jew in Europe”. Like Chesterton, Belloc did criticise Nazism. Chesterton and Belloc were also both staunch critics of the eugenics movement – though Chesterton’s book on eugenics included caricatures of Jews (See G. K. Chesterton, Eugenics and Other Evils, London: Cassell and Company, 1922; “Hilaire Belloc and the Ministry of Health,” Catholic Federationist, September 1920, 6). However, also like Chesterton, Belloc’s defence of Jews was somewhat equivocal. In his third edition of The Jews published in 1937, Belloc framed the problem of the Nazi persecution of Jews as one primarily of efficacy in solving the so-called “Jewish Problem”. Belloc asked what effect Nazi policy would “have upon a solution of the Jewish question?” “Is it,” he asked, “an advance towards a just solution of that question or not?” He observed that “there is no doubt that the Nazi attack was sincere” and that “there is no doubt that in the eyes of its authors it was provoked by a situation which they thought intolerable.” But the “Nazi attack”, he concluded, could be “neither thorough nor final.” Belloc argued that “it is not immoral, to declare a new policy and to say, ‘we will in future regard Jews as citizens of a different class from those around them, their hosts.” However, he concluded that the attack was unjust because “when things of that kind are done, justice demands that the effect shall be gradual, and that the loser by any new regulation shall be compensated.” It seems however that the main point of contention for Belloc was not that the Nazi policy was unjust, but that it was a failed policy. “The Nazi attack upon such of the Jewish race as are subject to Berlin is,” Belloc concluded, “not thorough, not final, but incomplete, and I think soon to prove abortive.” According to Belloc, “the policy has missed its mark, on lower grounds: it has missed its mark, because it has not dared to be thorough and has not had the competence to be well thought out” (Hilaire Belloc, The Jews, third edition, London: Constable, 1937, xxxix- xliii). At best these essays by G. K. Chesterton and Hilaire Belloc reveal an ambivalent sentiment about Jews (which is to say, thinly veiled antipathy towards Jews, combined with equivocal defences of them). They were more an attack on what Chesterton referred to as “truculent Prussianism”, and an equivocal criticism of Hitler, than a defence of Jews. And this was the period in which, according to his defenders, Chesterton’s discourse about Jews was at its most sympathetic. By Simon in Antisemitism, Dreyfus Affair, G. K. Chesterton, Hilaire Belloc on September 25, 2013 .